VC Series Vinyl caps are extremely flexible and Pliable. Can stretch up to 1/16 larger for a snug fit. These are durable protective closures which are ideal for use as thread protectors, dust and moisture seals, pipe and stud end, and for masking during painting or plating operations. Select the size that matches the OUTSIDE MEASUREMENT of your pipe or tubing. Made in the USA from soft PVC rubber like that will hold up for years of use. 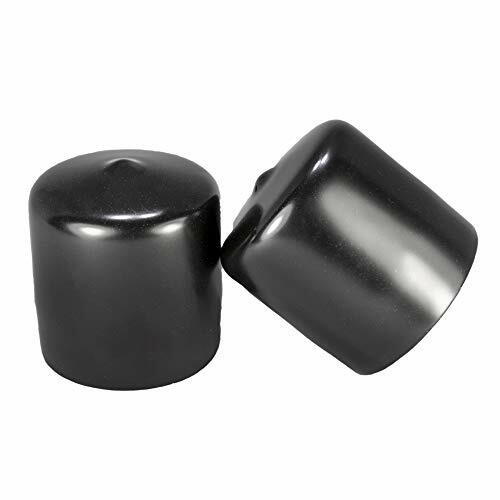 Round finishing caps for round tubing and rods make economical, attractive glides for everything from household and patio furniture to exercise equipment. As finishing caps they cover any scratches, burrs or distortions that may result from cutting operations. In addition, they also provide protection against injury from sharp rod and tubing edges. (Pack of 10) Caplugs: 7/8" to 15/16" Round Black Vinyl Flexible End Cap Bolt Screw Rubber Thread Protector Safety Cover | for 0.875 Inch Pipe Post Tubing Rod OD Protective Cover. VC Series Vinyl caps are extremely flexible and Pliable. Can stretch up to 1/16 larger for a snug fit. These are durable protective closures which are ideal for use as thread protectors, dust and moisture seals, pipe and stud end, and for masking during painting or plating operations. All caps are 1 tall / deep to provide a secure fit. The caps are 1 tall / deep to provide a secure fit . Made from soft PVC rubber like that will hold up for years of use. 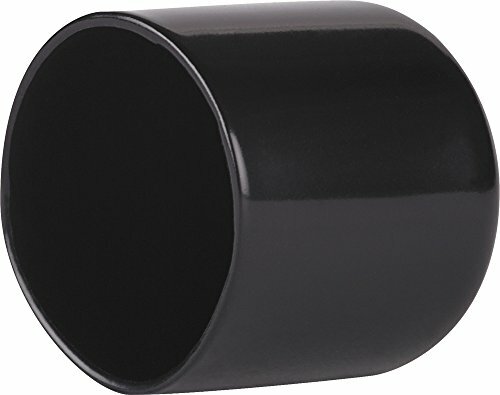 Round finishing caps for round tubing and rods make economical, attractive glides for everything from household and patio furniture to exercise equipment. As finishing caps they cover any scratches, burrs or distortions that may result from cutting operations. In addition, they also provide protection against injury from sharp rod and tubing edges. 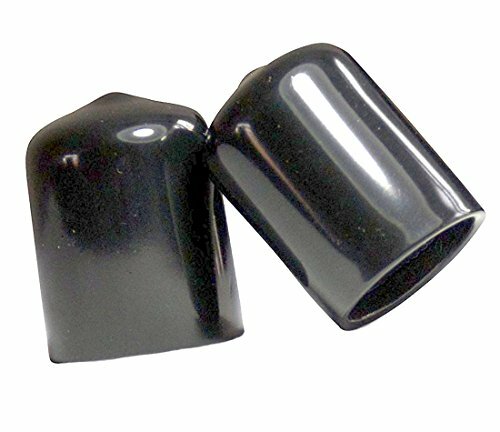 * COF Series finishing caps for round tubing and rods make economical, attractive glides for everything from household and patio furniture to exercise equipment. As finishing caps they cover any scratches, burrs or distortions that may result from cutting operations. In addition they also provide protection against injury from sharp rod and tubing edges. 38mm poly seal screw caps. Fits most one gallon jugs and growlers. Fits securely and can be used multiple times. 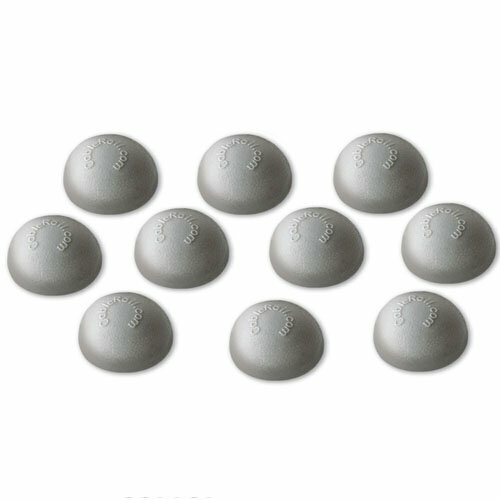 This is a set of 12 caps. 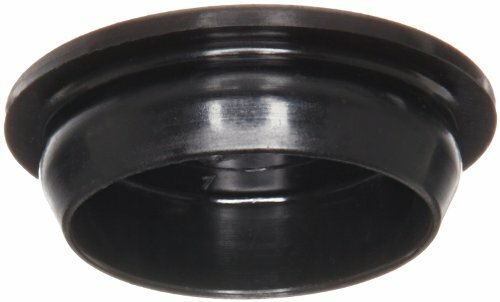 38mm poly seal screw caps by L. D. Carlson company, country of origin - United States, manufacturer name - Berry plastics. Poeppelmann manufactures plastic products for the automotive, electrical, household appliance, and packaging industries. The company, founded in 1949, is headquartered in Lohne, Germany. Fits 3" round OD tube or pipe ( 3" OUTSIDE diameter) & can stretch up to 1/16" larger for a snug fit without tearing or splitting. 1 1/2" deep / tall to provide a secure fit. 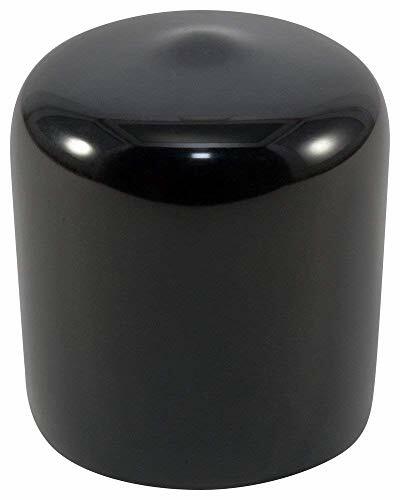 High-grade Prescott Plastics brand black soft PVC rubber like caps are made in the USA. Our caps are designed to hold up against impact abuse, and harsh weather conditions to provide years of protection. 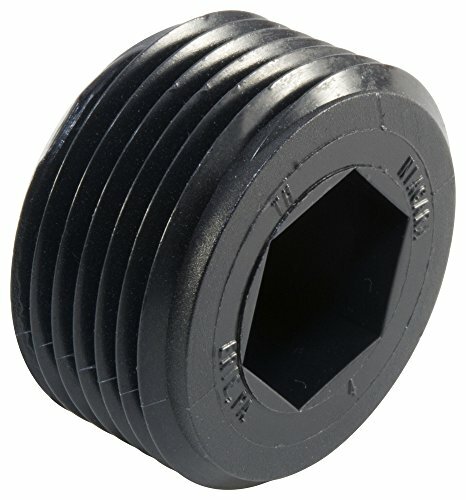 These easy to install 3.0 inch push-on caps serve as a long-lasting solution for many household, outdoor, & marine boat dock projects including replacements for fencing railing posts, steel gate rail stopper, rod / rebar or wrought iron caps, thread bolt screw or nut safety, hub cap sheath, or finishing any round tubing. TH Series threaded plugs are designed to protect internal threads during low pressure testing and in-plant process. Keeps contaminants and moisture from threaded ports. Oil and heat resistant to 250 degrees F. Not for permanent applications. : : B:.56, C:.50, PLUGNPTTS: 3/4-14. 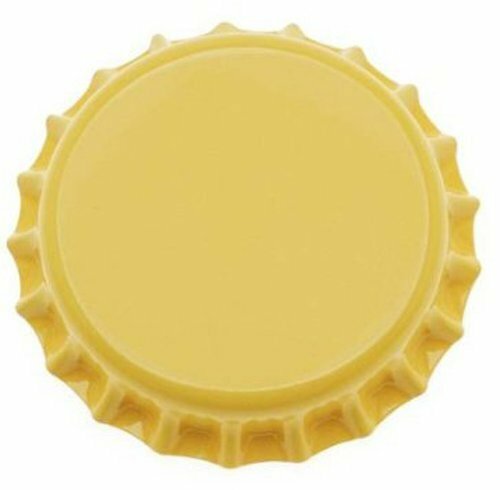 Brand: Caplugs | Manufacturer: Caplugs Inc.
Standard 27 mm crown caps for normal sized pry-off bottles. Features an oxygen absorbing lining to help prevent staling during mid to long term storage. Morrison 1779MCI-2100-1C Cast Iron Fill Cap, MNPT, Black, 2"
Designed for tank filling application where a tight fill connection is not required. Threaded body installs onto riser pipe or directly into tank bung. Brand: Morrison Bros. Co. | Manufacturer: Morrison Brothers Co.
Vinyl Thread Protectors are excellent for use as pipe thread protectors. The flexible vinyl material stretches over the threads to provide a tight seal that not only protects the threads, but also keeps contaminants out of the pipe or tubing. The pliable vinyl cushions the threads against damage and will not crack or shred like many hard plastic caps. Applications include: protection during transport, protection against liquids and/or dirt. (Pack of 4) Caplugs 1-1/8" to 1-3/16" Round Black Vinyl Flexible End Cap Bolt Screw Rubber Thread Protector Safety Cover | for 1.125 Inch Pipe Post Tubing Rod OD Protective Cover. 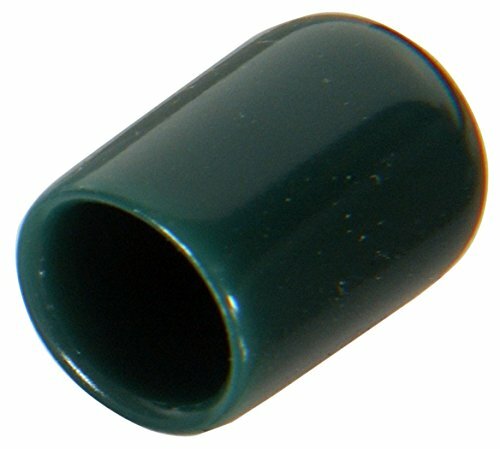 These colored end caps add a perfect finishing touch to Quick-Connects, SS Fittings and Snug-Grip Washer Nuts. 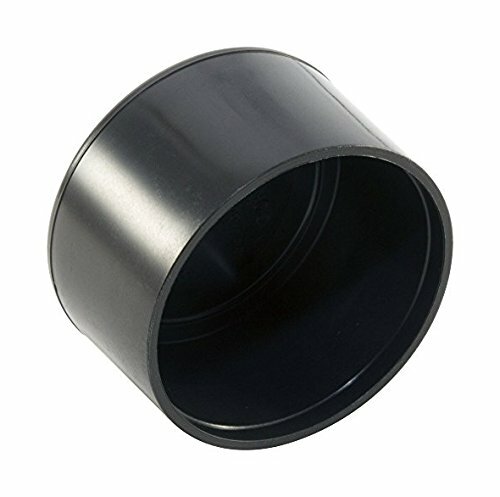 (Pack of 10) Caplugs: 5/16" to 3/8" Round Black Vinyl Flexible End Cap - Bolt Screw Thread Protector Safety Cover | for 0.312 Inch Pipe Post Tubing Rod OD Cover - 1" inside Height. Made from soft PVC rubber like that will hold up for years of use. Fits 1 5/8" round OD tube or pipe ( 1-5/8" OUTSIDE diameter) & can stretch up to 1/16" larger for a snug fit without tearing or splitting. 1 1/2" deep / tall to provide a secure fit. 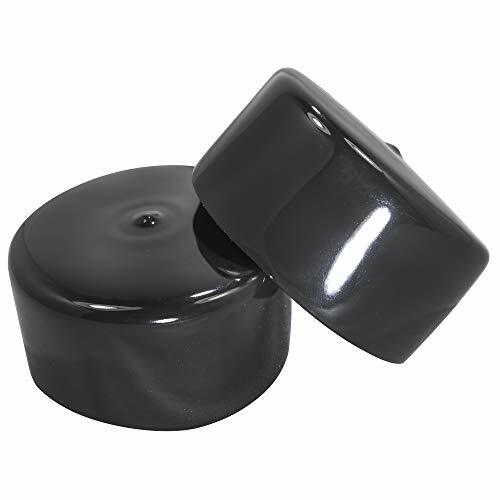 These easy to install 1.625 inch push-on caps serve as a long-lasting solution for many household, outdoor, & marine boat dock projects including replacements for fencing railing posts, steel gate rail stopper, rod / rebar or wrought iron caps, thread bolt screw or nut safety, hub cap sheath, or finishing any round tubing project. 10 each: 1/8, 1/4, 1/2, 3/4, n 1.0, (Total 50), 5 each: 3/16, 5/16, 3/8, 5/8, n 7/8, (total 25) - Grand Total 75. Made in The USA by Caplugs, an ISO 9001 Certified Company. 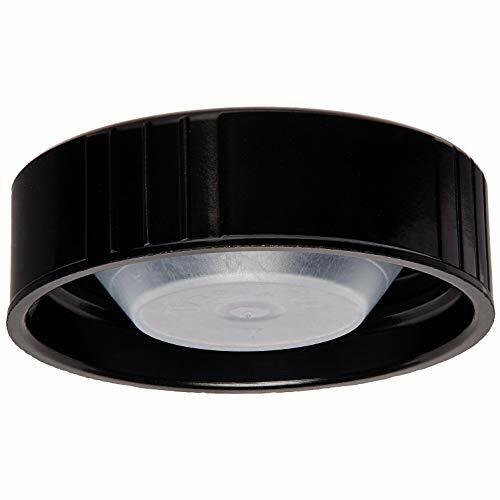 VC Series caps are extremely flexible and durable protective closures which are ideal for use as thread protectors, dust and moisture seals, pipe and stud end color coding, and for masking during painting or plating operations. All caps are 1 height / deep to provide a secure fit. Hardness Durometer 75A, Maximum Temperature180 F, Color Black. 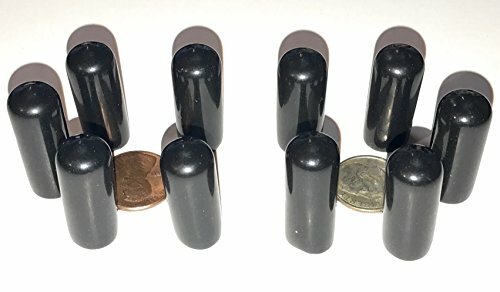 (Pack of 10) 3/16" to 1/4" Round Black Vinyl Flexible End Cap Bolt Screw Rubber Thread Protector Safety Cover | for 0.187 Inch Pipe Post Tubing Rod OD Cover - 1" Inside Height.